FREE MARKET PRINCIPLES ARE THE FOUNDATION OF OUR STRONG TEXAS ECONOMY. True free market policy creates a level playing field and gets out of the way for business to thrive - the rules apply the same to all. The motor vehicle franchised dealer system in Texas creates a level playing field so that there is fierce competition on price and service among dealers, and there is consumer protection afforded to the buyer over the lifetime of the vehicle. Now ONE manufacturer is seeking to overthrow the current law in favor of creating a monopoly for themselves. When Texas franchised dealers make a profit, that capital is reinvested right here in Texas. Tesla’s profits will be exported to California leaving NOTHING for Texas. Texas dealers are proud partners with their local community - creating jobs and supporting philanthropic efforts critical to our Texas way of life. Why should Texas legislators throw away beneficial laws for the sake of a California liberal? They shouldn’t and Governor Abbott agrees: “Texas has a very robust, very open, very effective automobile sector that seems like it’s working quite well the way that it is. If you’re going to have a breakdown in a car, you need to have a car dealership there to make sure that the vehicle is going to be taken care of. We haven’t seen that from Tesla.” Read more. Nothing in state law is preventing a citizen of Texas from purchasing a Tesla today. Many Texas franchised dealers are eager to help Tesla succeed and have contacted Tesla seeking an opportunity to retail their vehicles – including offering to absorb any capital expenses required for the Tesla model. Tesla would instead prefer to blow up the Texas model – putting their own profits over Texans, Texas jobs, and Texas communities. In a true free market established laws apply equally to all. 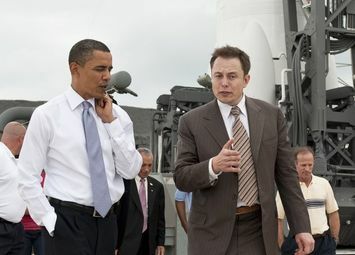 Elon Musk (pictured above with President Obama) and Tesla just don’t think the rules should apply to them. They are asking for a change to state law that no other manufacturer is seeking. They want to create a monopoly just for them, allowing them to sell their vehicles at one non-negotiable list price and export every penny of profit to California, leaving nothing for Texas. The Texas franchised dealer system protects consumers and prevents monopolies through competition on motor vehicle sales and service. Ironically, Tesla supporters say that they believe in free enterprise unencumbered by government interference and that they support the immediate removal of government barriers. Yet Tesla has existed and indeed intends to continue to exist with significant government handouts and subsidies. One conservative journalist recently said that Tesla is, “worse than Solyndra.” There’s a certain irony that Mr. Musk complains about government intervention such as consumer-protection driven franchised dealer laws, yet Tesla wouldn’t exist as it does today without massive government handouts and subsidies. Click here to learn more. Tesla will say their government handouts are no different than the automotive bailout in 2008. Let's be clear- no dealer received a bailout. Why should a California company come in and call the shots in Texas when the current law protects consumers and ensures competition? We simply don’t believe that’s how Texas should do business. Join us in saying NO to California special interests and support local Texas franchised dealers.